BYU researchers (from left) Norm Jones, Alan Zundel, and Jim Nelson are up to their necks in water-modeling studies. They have traveled across the globe to train engineers on the software they created to model groundwater, surface-water , and watershed. They popular programs are now used in more than 100 countries. Salt Lake City—2001. The Olympics aren’t scheduled to begin for a few more months, but already a group of engineers is preparing against the threat of terrorist attacks during the Games. Sitting at their computers, they wait for the next “what if?” scenario. The message arrives. Terrorists have just blown up the Jordanelle Dam near Park City. The computer monitors begin to glow in vibrant colors and graphics, mapping out the route of the floodwater down the canyons. Even a nonengineer watching over their shoulders can easily comprehend the basics—the varying depths and speeds of the water flows in different parts of the canyon and the structure of the cliffs and valleys—all represented in smooth 3-D animation. Within a few hours the engineers can accurately predict the locations and amount of damage such an attack would cause, which in turn facilitates the creation of a good response plan. Watershed Modeling System (WMS), the software that made these Olympic preparations possible, is one of three highly successful hydrological engineering programs developed in BYU‘s civil and environmental engineering department over the last 12 years. Explaining the genius of the software in layman’s terms, assistant professor E. James Nelson, ’89, one of three civil engineering professors who created the software, says matter-of-factly, “You can see water visually instead of numerically,” which is to say that an engineer using the BYU programs can see flows and bodies of water on screen, in brightly colored 3-D animations, instead of getting the mathematical representations that were typical of earlier modeling programs. And, moreover, the BYU software is much more detailed and precise in its models than most of the industry standards, allowing engineers worldwide—including Cairo, Bosnia, and Beijing—to create better plans for everything from water management and conservation to pollution control and disaster planning. The somewhat serendipitous genesis of these programs came in the 1980s, after Henry N. Christiansen, ’65, a BYU professor of civil engineering and head of the engineering computer-graphics laboratory, wrote a 3-D graphics rendering program called Movie BYU—one of the first and best of its kind. As Hollywood and the aerospace industry forged ahead to perfect 3-D animation technology, they often used Movie BYU as a programming base. In 1991 Norman L. Jones, ’86, joined the BYU civil engineering faculty, having just finished a PhD at the University of Texas at Austin on the visualization of underground stratigraphy. Realizing that no one had yet applied rendering programs like Movie BYU to hydrology, Jones teamed up with Nelson and colleague Alan K. Zundel, ’88, an assistant research professor, and together they built upon Jones’ research and the graphics-rendering codes that had evolved from Christiansen’s earlier research and developed a new generation of visual water-modeling software. During this process, Jones remained focused on deeper matters—that is, on the modeling of groundwater—and he eventually developed Groundwater Modeling System (GMS). Zundel, immersing himself in the study of rivers, lakes, and coastlines, created Surface-water Modeling System (SMS). Meanwhile, Nelson worked on watersheds and developed WMS. Malaysia. Syria. Mozambique. Even Antarctica. 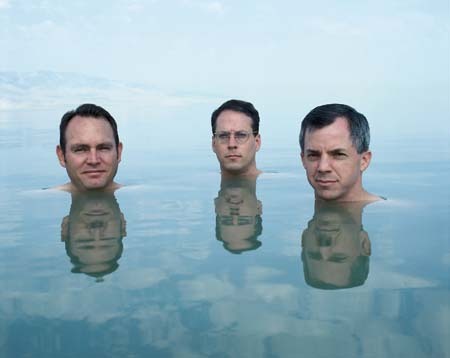 In each of these places engineers are now using BYU‘s water-modeling software. In fact, WMS, SMS, and GMS have found homes on hard drives in more than 100 countries and more than 9,000 organizations. Jeffrey D. Jorgeson, research hydraulic engineer for the U.S. Army Engineer Research and Development Center, is well aware of the strengths of the BYU software; his organization, which benefited from Jones’ original research, has supported BYU from the beginning, and Jorgeson himself regularly uses the programs in support of Army operations worldwide. For example, in addition to its use at the Salt Lake Olympic Games, the software was used in Bosnia in 1996, when U.N. peacekeeping troops were moving into a new area during an unusually wet season. The commanding officers, armed with detailed maps of the area, had plotted a course through the countryside, but they soon met with an unexpected problem. 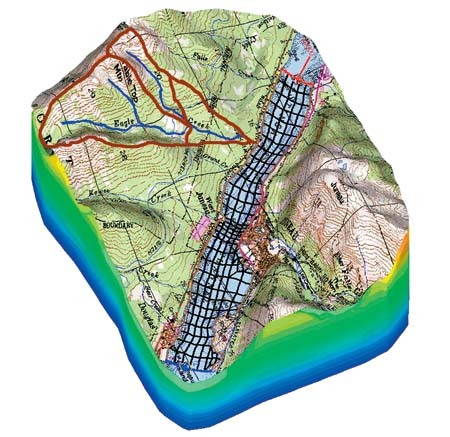 WMS, SMS, and GMS use digital terrain maps and other data to model groundwater, watershed, and surface water, as in this conceptual rendering. Engineers plugged the necessary data into the software and were quickly able to estimate when the river would return to its normal size. The software’s usefulness, however, hasn’t been limited to international missions; many national, state, and county agencies have been eager to sign up for training courses and learn the BYU programs. “We’ve done training courses for Pennsylvania and Maryland and several of the Southern states,” recalls Zundel, later naming off several more states. Think of Arizona or Nevada. Now, take away the late-summer monsoon season, during which these states receive much of their annual rainfall. What remains resembles much of the Middle East. It’s no surprise, then, that water is a political flashpoint in the region. Nor is it a surprise that Radwan Al Weshah, regional hydrologist for UNESCO, invited A. Woodruff Miller, ’69, chair of BYU‘s Department of Civil and Environmental Engineering, along with a group of BYU students to come to Cairo and offer training sessions on the BYU software in April of this year. The BYU software allows engineers worldwide to create better plans for everything from water management and conservation to pollution control and disaster planning. Hydrologists in the Middle East aren’t the only ones benefiting from training visits. Engineers in China are also getting face-to-face tutorials on the water-modeling software. Engineers at Beijing Normal University are already realizing the benefits of the program. With help from the civil-engineering faculty at BYU, they’ve been able to use the software to study a reservoir that until recently was the principal source of drinking water for Beijing. Unfortunately, the reservoir water has become so contaminated by industries that it is no longer safe to drink. With the water-modeling software, the Chinese engineers are now able to scrutinize the more than 200 riverside manufacturers to find out which are the worst polluters, with the end goal of arriving at a cost-effective, long-term solution—one that will minimize pollution without destroying industry. With support from BYU administrators—who have awarded the program mentoring grants to enable student participation in the trips to Cairo and Beijing—Jones, Zundel, and Nelson have almost more projects than they can handle. Nelson recently returned to Amman, Jordan, to reunite with Weshah and provide further tutorials on WMS; Jones is planning another trip to Cairo with students next year to offer training on GMS; and all three professors went back to Beijing in September to demonstrate the BYU software to Chinese government officials, who are in the process of approving the software for use by Chinese engineering agencies. As the world’s population continues to grow, so will the need for water management and conservation, making these water-modeling programs more and more important. And for Nelson, Jones, and Zundel, who are enjoying the opportunities to further the good reputation of BYU, that’s just fine. The design of a new highway near Montgomery, Ala. involved the application of Surface-water Modeling Software (SMS). The new highway was to be built near a floodplain of the Montgomery River. A specific stretch of the highway ran through the center of a long, winding bend in the river. There was some concern the highway would become a flow barrier during the annual flood stage for the river. This would back up the water flow, which would cause flooding in the main part of Montgomery. SMS was used to build a model of the floodplain area and simulated the flow conditions at flood stage, which is depicted in the movie above. This simulation helped ensure that the relief openings placed beneath the highway were large enough for the floodwater to pass beneath the highway and prevent flooding. Return to Water-Modeling Animations RIVER-EROSION STUDY A recent Mississippi River study illustrates how Surface-water Modeling Software (SMS) can be used effectively. River officials were concerned about how large barges on the river stirred up sediments and caused erosion. Several solutions were studied including widening the channels and forcing the barges to adhere more closely to the center of the channel when navigating the river. As part of the study, a physical model was built of selected sections of the river and model barges were pulled through these sections (view video, above). At the same time, the SMS software developed at BYU was used to build computer models of the moving barges (view animation, above). The computer models were more effective than the physical models because they were cheaper to use in the study, and they allowed the engineers to analyze a wider variety of scenarios. Return to Water-Modeling Animations CONTAMINATION PLUME The Groundwater Modeling Software (GMS) software is used to help protect precious groundwater resources. Using GMS, planners can analyze the effectiveness and cost of various strategies for cleaning up contaminated aquifers. GMS can also be used to perform capture-zone analysis for municipal wells to ensure that hazardous chemicals are not stored or used in the recharge zones of the wells. GMS can also be used to build simulations that provide valuable input to difficult groundwater management decisions. The animation above shows how a contaminant might spread through a given ground composition over time. Return to Water-Modeling Animations WATER-MODELING ANIMATIONS Software created by BYU environmental engineers makes it possible for governments and organizations worldwide to study and predict surface-water, groundwater, and watershed behavior. Below are links to several water-modeling animations created by this software. (See also “Modeling the World’s Waters.”) Floodplain Model The design of a new highway near Montgomery, Ala. involved the application of Surface-water Modeling Software (SMS). SMS was used to build a model of the floodplain area and simulated the flow conditions at flood stage. River-Erosion Study A recent Mississippi River study illustrates how Surface-water Modeling Software (SMS) can be used effectively. River officials were concerned about how large barges on the river stirred up sediments and caused erosion. 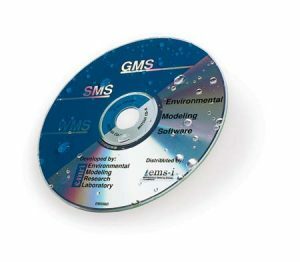 Contamination Plume The Groundwater Modeling Software (GMS) software is used to help protect precious groundwater resources. Using GMS, planners can analyze the effectiveness and cost of various strategies for cleaning up contaminated aquifers. Brigham Young University has been recognized as the best in the nation at turning research dollars into inventions and new companies. The July 19 issue of the Chronicle of Higher Education also noted that BYU ranks third among American universities at earning income from inventions relative to research spending. (www.byu.edu/news/releases/archive99/Nov/hearingaid.htm). When BYU professors and students develop a research advance that shows commercial promise, the university obtains patents and forms agreements with corporations to market the new inventions. Astle and his coworkers are excited about one of the university’s newest technologies, a method of building carbon fiber structures that are 12 times stronger than steel (www.byu.edu/news/releases/archive02/May/pyramatrix.htm). The product has been licensed to a new Utah company formed to commercialize it. BYU earns $3-5 million from inventions and creative works each year. The university generally passes on about half of this income to the inventing professors and puts the rest into licensing costs and further research in the professors’ colleges.